A team of Northwestern students and researchers help a central Illinois village take on contamination. There was a time when the pristine waters of Lake DePue made the Illinois River village a destination for boaters, anglers and ice harvesters. Now there is little that is pristine about the spring-fed lake or the adjacent village of DePue. But Northwestern researchers and teams of students in law, chemistry, engineering and medicine are going to bat for residents of the beleaguered village. More than a century ago, the New Jersey Zinc Co. ran a smelting facility in DePue — a rural village 100 miles southwest of Chicago. The company produced slab zinc for the automobile and appliance industries and zinc dust for corrosion-resistant paints. In the 1960s the company added a fertilizer plant. Those industries are long gone — the plants were demolished in 1991 — but a mountain of contamination remains. Residents refer to one fenced-off 750,000-ton slag mound as “the black pile of death.” That’s just part of 950 acres of tainted land in the Superfund site. Heavy metals leach into groundwater, and contaminated debris blows onto private property, exposing residents to arsenic, lead, mercury, cyanide and cadmium, among other contaminants. The responsible parties, ExxonMobil and CBS Corp., had acquired the original companies through a series of mergers and acquisitions. Seventeen years ago they signed a consent order to study the contamination and develop a cleanup plan. Residents frustrated with years of perceived inaction from ExxonMobil and CBS and the Illinois Environmental Protection Agency called Nancy Loeb, director of Northwestern’s Environmental Advocacy Center at the Bluhm Legal Clinic, in November 2010. Loeb says she was “shocked” at the contamination she saw on her first visit to DePue. “Eye-opening is an understatement.” She and her students began representing the village as pro bono counsel in negotiations with the Illinois attorney general and the Illinois EPA. 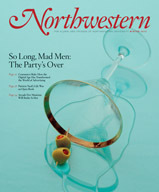 Loeb quickly called on her Northwestern colleagues to help assess the situation. When she needed expertise to analyze reports on the human and ecological health risks in Lake DePue, she called on environmental engineering professor Kimberly Gray (WCAS78). Loeb then tapped chemistry professor Franz Geiger, who had earlier led the development of a website and mapping project that showed uranium contamination on Navajo lands in the Southwest. With grant funding from the Initiative for Sustainability and Energy at Northwestern and the National Science Foundation, Geiger’s doctoral student Sarah Gomez recruited four interns who spent six months synthesizing nearly 20 years worth of lab reports, inputting concentrations for thousands of samples. While no longitudinal health studies have been conducted on the residents of DePue, heavy-metal contamination in general leads to increased incidence of neurological issues and cancer. Teresa Woodruff (G89), director of the Feinberg School of Medicine’s Women’s Health Research Institute, is embarking on a study of reproductive health in the DePue community. The cleanup matter is now with the Illinois EPA. “We fear the process of doing studies and reports will go on for several years before any final decisions are made about remediation,” Loeb says. The interim consent order signed in 1995 doesn’t provide for cleanup, so the Illinois EPA and the attorney general’s office will have to negotiate another consent decree.